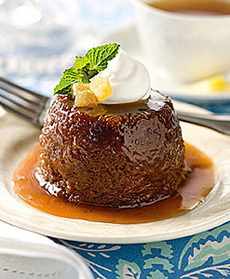 How about some Bourbon whipped cream on your sticky toffee pudding? Photo courtesy MackenzieLtd.com. This is Page 2 of a three-page article. Click on the links below to visit other pages. Enjoy this with chocolate, coffee, nut, pumpkin and vanilla desserts. Chill the bowl and cream thoroughly before beginning. Chill the bowl, beaters and cream thoroughly before beginning. Using an electric mixer, whip cream, sugar, and vanilla on medium-low speed until frothy, about 30 seconds. Increase speed to medium-high and beat until soft peaks form. Add Bourbon and continue to beat until stiff but still creamy. Makes about 2 cups. Add a little spice to chocolate, coffee, pumpkin, sweet potato and vanilla desserts. Chill the bowl, beaters and cream thoroughly before beginning. Using an electric mixer, whip cream, sugar, and five-spice on medium-low speed until frothy, about 30 seconds. Increase speed to medium-high and beat until stiff but still creamy. Makes about 2 cups. The cinnamon and nutmeg flavor of this whipped cream is perfect for the holidays with pumpkin pie and sweet potato pie, or to give a holiday twist to chocolate or coffee desserts, including ice cream. Chill the bowl, beaters and cream thoroughly before beginning. Using an electric mixer, whip cream, sugar, cinnamon, and nutmeg on medium-low speed until frothy, about 30 seconds. Increase speed to medium-high and beat until stiff but still creamy. Makes about 2 cups. Lavender pairs wonderfully with fresh fruit, fruit desserts, pound cake, lemon poppyseed cake and anything chocolate. And vanilla ice cream, of course. Combine cream and lavender in a small mixer bowl; cover and refrigerate for 8 hours so the cream absorbs the lavender flavor. Strain and discard the lavender. Chill the bowl, beaters before whipping. Using an electric mixer, whip cream and sugar on medium-low speed until frothy, about 30 seconds. Increase speed to medium-high and beat until stiff but still creamy. Makes about 2 cups. Serve this with nut desserts including pecan pie, or a sundae with vanilla or caramel ice cream. If you love salted caramel as much as we do, see our favorite salt caramel chocolates. Chill the bowl, beaters and cream thoroughly before beginning. Using an electric mixer, whip cream and salt on medium-low speed until frothy, about 30 seconds. Increase speed to medium-high and beat until soft peaks form. Add caramel and continue to beat until stiff but still creamy. Makes about 2 cups.